Have I ever done an all-in-one overview of what Dreamblazers is in a single easy-to-access post? Nope! But that’s up now over on the brand new Dreamblazers page. 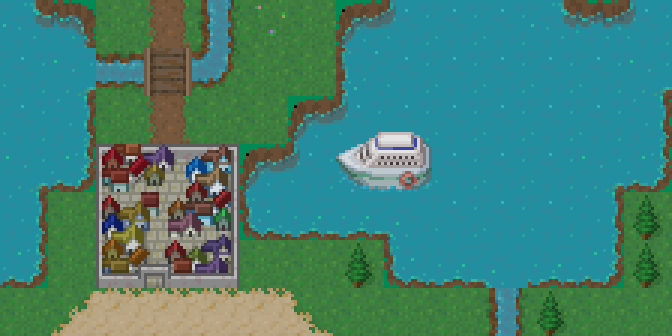 It took a while to create, but this was a necessary step for what’s coming this week: bringing on more pixel artists! This will be the foundation I use for explaining the game to people from now on, whether it’s on here, on IndieDB, on Steam Greenlight, bringing on pixel artists, bringing on a composer, or anything else in the future. And… this is also take 2 on doing bonus posts later in the week. 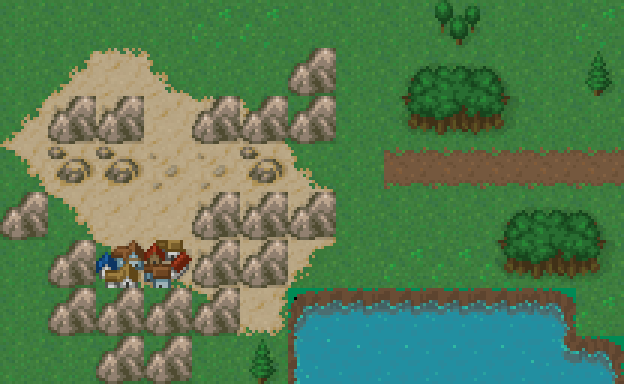 For sure there’s going to be a “help wanted” page directed at prospective pixel artists, but we’ll also see if I can get up one of the multiple map layout posts that I’ve been meaning to do. 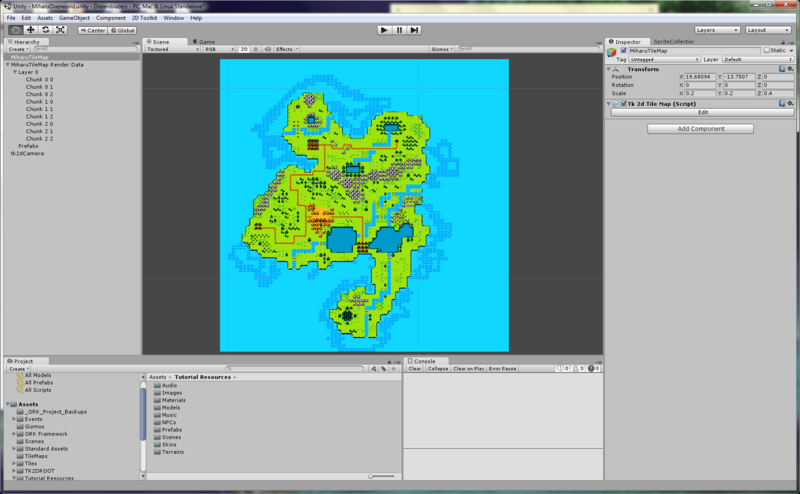 The final pre-Kickstarter tileset is underway, by the way, so that increases the odds no doubt. This entry was posted in All Text, Devlogs, Dreamblazers on April 27, 2015 by JellyPaladin. Actually, there are still more finished faces than these, but I left them out because how could I bring myself to reveal spoilers? Nobody wants to know in advance who dies, gets horribly disfigured, turns out to secretly be another character’s sister, cuts their hair to symbolize inner change, gets transformed into a dog, swallows a cake whole, or disguises herself as another character. Leaf previously had not one but two base heads that were each only used for a single expression, so they’ve been repurposed for extra fun. Along with Jelia, Jig got the biggest face count upgrade, nearly doubling her faces—which is appropriate since I felt that the faces I’d asked for previously only captured about half of her personality! The new face with her goggles down is one of my favorite additions in the whole collection. Sakura sure does a lot with her hands—so much that she even makes a cameo interruption in Tango’s portraits! Her new salute and victory sign can actually be used with any of her expressions (and her hand in Tango’s portraits can also be used with any of his), so I only picked two to use as examples. As embarrassing as it is, I actually forgot that my own Cecille is an elf when giving her description, so her ears have now been updated along with her new faces. Even aside from that, I’d say she gained the most of any character when comparing her current range of emotions to her first draft range, which was a bit one-dimensional. Similar to Sakura, Lash‘s kunai can now be used with any of her faces. This entry was posted in Devlogs, Dreamblazers, Video Game Art on April 20, 2015 by JellyPaladin. Why’s it named Winny Spring? Well, you’ll find out later. =P But the answer partly explains why the town is half-grassland and half-desert! 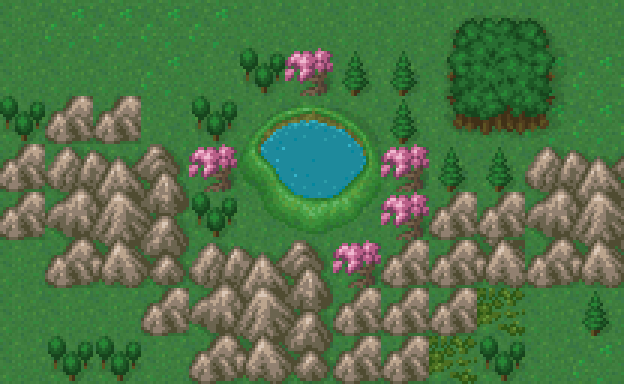 The area around Spring Lake Valley, so named because it’s the valley in which there are sakura trees and a lake! Relatively sheltered by its elevated terrain, Spring Lake is crystal clear and one of Miharu’s most well-known sights. The area around Deltaru Tri-Port, sometimes called the symbolic capital of Miharu. Where else will you find a city that borders the ocean and two lakes and a river? Answer: nowhere on the planet! A major theme in Dreamblazers is that the world is often more beautiful than anyone would imagine if they hadn’t seen it for themselves, so I hope that unique locales such as these will communicate that sense of wonder and discovery. This entry was posted in Devlogs, Dreamblazers on April 13, 2015 by JellyPaladin. As hinted last week, it’s Tango’s portrait collection, drawn as always by Flora! The bard Tango Moonlight is sort of Dreamblazers‘ narrator—the eyewitness account who’s relating the tale of everybody’s bravery! Of course, sometimes he’s prone to exaggerate his own role… he’s not an especially talented fighter or adventurer. =P But the beauty is that he doesn’t have to be: as long as he can strengthen the good fighters with his magic, he’s making all the contributions he needs to. Other than Lucky, who’s a non-humanoid character, our range of characters for these portraits is now concluded—but not our range of faces! Most characters will receive at least a couple additional faces in the future as time permits. 1) Going public on the ORK Framework forums. I mentioned wanting to do this a while back when the title image was first drawn, but I’ve waited because I also thought I should be able to show off some in-game assets along with it. My writeups are ready, so the assets are the last missing piece. 2) The search for more artists! There’s still so much more to do on the pixel art front outside of environments that Becca suggested she could put out a call to arms to her myriad pixel artist followers. That sounded great to me, but I did believe it would be best if we held off until I could at least show off one mostly-finished location to give the artists for characters and monsters and everything else a visual of the world that they’re adding to. Yes, I still believe what I’ve said that one of my biggest mistakes was not pursuing artists months earlier than I have… but I’m treating that as a sunk cost rather than trying to rush now to compensate. As the time comes for at least one more pixel artist and likely at least two more, I’m filled with both excitement and trepidation. Teamwork is a wonderful process, but an involved and complex one as well. I’ve spent many an hour pacing back and forth in the hall, trying to put in words for myself what I want from a character design or a pixel art concept—because these are the realizations of my dreams, after all, but unlike the gameplay and the story, I’m not the one directly creating them. In many ways it’s tougher than directly creating them. In the end, I just hope deeply that everyone I team up with feels the same sense of progress and dreamblazing that I do. This entry was posted in Devlogs, Dreamblazers on April 6, 2015 by JellyPaladin.